Railroads and industry brought immigrants to the Southern Tier in the latter half of the nineteenth century. In Salamanca, a small trickle of Poles settled the area and then a short wave followed as the villages around Poznan heard of the prosperity that was to be had in Cattaraugus County. The Poles who moved to the region that were Catholic began to attend St. Patrick’s Church. As the Polish population grew they became dissatisfied with the Irish dominated parish and when Polish American politician Jacob Rozan stopped in Salamanca for a visit, he encouraged them to organize. By December of 1892, with the permission of the bishop and the guidance of Father John Pitass, Father Peter Basinski gathered 70 of the Polish families of Salamanca and established Holy Cross Parish. The parish’s first parcel of land was purchased in the summer of 1893 with the cornerstone of the first church being laid September 3. The church was completed in three months, but in that intervening time the parish saw its first baptism, that of Franciscam Kasperek and its first wedding, between Antonii Marcinkiewicz and Apolonia Stachowiak. Both events were held in St. John’s Hall at St. Patrick’s Church. The formal dedication of Holy Cross was held on December 3, 1893 with Polish priests from around the diocese assisting in the ceremony. Over the next 10 years a rectory and school were added to the complex. 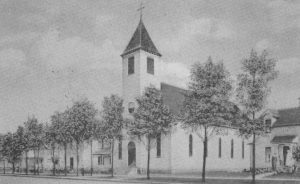 On June 17, 1902 Holy Cross Roman Catholic Church was legally incorporated under New York State law, with Stanislaus Jarzembowski and Maximilian Zaporowski being named as the parish trustees. The Felician Sisters began teaching at the school in 1906 when enrollment reached 150 students, living in a simple home that was converted into a convent. The first quarter of the twentieth century was a time of stability at Holy Cross. The parish experienced modest growth and for the most part the facilities met the needs of the congregation, but by the end of 1922 things were getting a little tight in the small wooden church. In March of 1923 the fourth pastor of Holy Cross, Father Adalbert Cichy, announced that the parish would begin building an $80,000 church. The groundbreaking ceremony was held on July 22 while the cornerstone was laid on October 14. The A.W.E Schonberg designed tapestry brick church called for a 53 feet wide, 155 feet long, and 34 feet high sanctuary with a 120-foot spire reaching into the air. In the basemen six school rooms were included to accommodate 50 children. The total capacity of the furnished $100,000 church was 500 people. When it was formally dedicated September 28, 1924 over 1,200 people attended including representatives of St. Adalbert’s Society, the Polish National Alliance, and the Polish Roman Catholic Union. The ceremony was officiated by Msgr. Francis Kasprazk of Transfiguration Church in Buffalo with Fathers Joseph Czerwinski of Transfiguration in Olean, Joseph Winnicki of Precious Blood, and Ladislaus Brejski of St. Valentine assisting. In the late 1920s, the young men of the parish who shared an interest in sports began meeting regularly. Wanting to create local teams for various events the men formed the Holy Cross Athletic Club in 1930, naming it in honor of their parish. The first president of the organization was Julian Matecki with Carl Dolecki, Max Pavlock, Andrew Bloom, and Ed Dolecki making up the rest of the board. The club was incorporated in 1934 and their own clubhouse was built in 1954. It would take until 1948 for the church to be fully paid off. To celebrate, the parish purchased a new bell. Other improvements were made to the building including installation of stained glass in 1965. Produced by Perkins Stained Glass Studio of Rochester the windows include popular holies like St. Francis and St. Anne as well as a distinctly Polish Our Lady of Czestochowa donated by the Star of Liberty Lodge #476 of the Polish Women’s Alliance of America. In the twenty-first century Holy Cross has prevailed. Despite the loss of industry and the 1970 closing of the school, Holy Cross remains a beacon of Polish Catholicism in the Southern Tier. "Church Dedicated." Buffalo Morning Express [Buffalo, NY] 27 Sept. 1924: 5. Print. Ederer, Martin F. "Catholic Polonia in Western New York - 8 Cattaraugus County's Polish Parishes." Am-Pol Ealge [Cheektowaga, NY] 27 Jan. 2005: 16. Print. "Nubbins O'Nearby News." Jamestown Evening Journal [Jamestown, NY] 30 Sept. 1924: 8. Print. "PGSNYS" Polish Parishes of WNY - Detail. 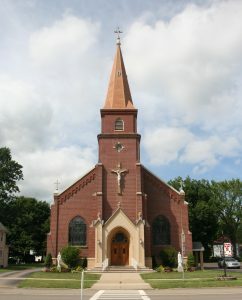 Holy Cross, n.d. Web. 19 Nov. 2016.